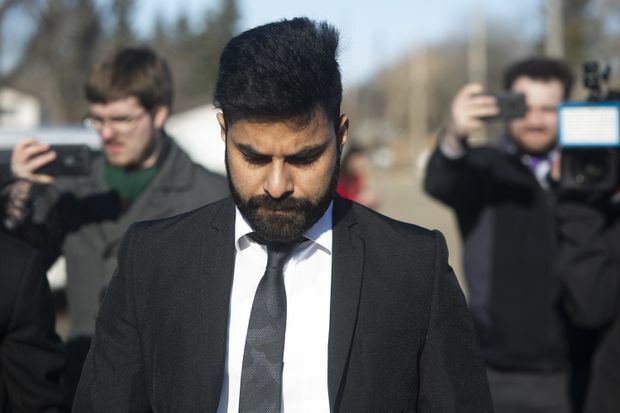 Jaskirat Singh Sidhu arrives for his sentencing hearing in Melfort, Sask., on March, 22, 2019. In her ruling, Cardinal cited several considerations she made in her decision. Sidhu entered early guilty pleas to all charges. He apologized in court to the victims and their families. Cardinal said she believes his remorse is sincere. Although not physically injured, he will suffer psychologically. He is 30 years old with no previous criminal history and a clean driving record. Alcohol or drugs were not involved. Sidhu had not been using his cellphone while driving at any point before the collision. He faces deportation after his sentence. Sidhu was driving a large commercial vehicle and missed five highway signs, including a large stop sign with a flashing light. He had ample time to stop but did not brake, reduce his speed or take evasive action. His actions killed 16 innocent people and caused life-altering injuries to 13 other innocent people. The devastating impact of the crash and its aftermath on families, friends and survivors cannot be measured. The injured face lifelong challenges as a result of physical and psychological injuries. “The impact of this catastrophe will reverberate across Canada for years to come,” said Cardinal.